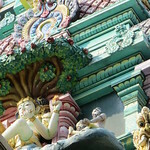 I wasn't knowing quite what to expect in Singapore, but my first thought was certainly not of Hindu Temples. In reading my Singapore history, however, I learned all about the large south Indian population that migrated there. One of my chief sightseeing goals ended up being the Little India neighborhood. It was quite interesting and filled with the sights and sounds of India (maybe even perhaps enough to sait my appetite for India!). 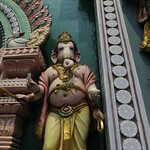 There were a number of Hindu Temples around other parts of town, including the Sri Layan SIthi Vinayagar Temple right around the corner from my hotel in Chinatown which greeted me each morning with bell ringing at 0730hr. 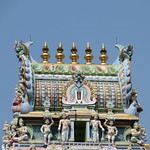 The temples were all very active, crowded with devotees and alive in full Bollywood Technicolor! This was my "local" Hindu temple, just a few steps from my hotel and within earshot of the bells that would ring at certain hours (such as 0700hr. This was also my first experience of the "smashing coconuts". This is the rite where the devotee takes a coconut and smashes it (in a metal box with stone in the center); this symbolizes the shattering of obstacles to spiritual concentration. It took me a while to find this temple, but when I did it was dusk, turning to night and it was a very nice view of the temple. The deities in the dark and light were quite spectacular! Very disappointed to see that this temple was under re-construction. All covered in scaffolding and hidden away. There was a little "pop-up" temple for devotees. Very large temple complex, unfortunately, it wasn't open when I was there so I had to settle for the spectacular exterior and some long shots into the inside. Another active temple in the Little India section of Singapore. Large temple in the Little India section of Singapore. It was very active and being decorated with flower garlands on my visit. Very active coconut breaking when I was there! Curious temple in that it's hard to see from the street. Built for North Indians, it was closed when I visited, but got a good view of the front exterior, much of it is hidden from regular street view.